The Walabot DIY is a smart sensor device. It works with your smartphone and let you know what is happening inside the wall. It is also a stud finder for walls and helps you to see through Phone. The gadget connects through App, Just download the app from Google Play store. You can also download Walabot for iPhone OS. In this Walabot Review, we will discuss every important thing related to Walabot. You can use this device to find the best spot to drill a hole, hammer a nail, and also helpful in avoiding accidents such as damaging pipes. The Walabot device has adjustable sensitivity which allows you to see through the different types of walls. After connecting it to your smartphone, the Walabot device also allows you to take snapshots for later review. 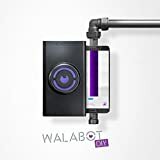 Walabot is able to detect even plastic, metal pipes and electrical wires additionally it works as a stud finder for walls. Walabot can also determine and let you know the depth of the wall and makes easy for you to select the perfect tool for drilling. It is the perfect device for homeowners and professionals. How does Walabot DIY work? It is really important to know that how does a stud finder works. The device is very easy to install. You do not need to be the expert to use the product. You can install it by yourself just by following these simple steps. All you have to do is just download the official App of Walabot DIY on your android phone. You can also download Walabot for iPhone. After installing the App, just connect the device to your smartphone via the USB cable. What can Walabot DIY do for you? It provides the facility of taking the snapshot for offline uses. Finds out movements that help you to find out the existence of studs so that you can look for the home of the studs. What is there in the box of Walabot DIY? A Walabot DIY screen protector. Also, in this Walabot review article, we are going to discuss the advantages and disadvantage of Walabot device. Advantages of Having A Walabot DIY? The Walabot is the perfect device to help you when you want to do some construction work. The product allows you to identify hidden objects. Means it is a stud finder for walls and helps you to see through Phone as it is designed to sense the presence of movements. The product is very easy to use. All you have to do is just download the app and connect it to the phone. And it’s all set to use. Walabot DIY works efficiently through cement, drywall, and wood. With the most advanced technologies, Walabot is winning hearts of millions. The product is also won several awards. The device comes with an excellent offer. This time you can get the superior service of Walabot DIY with an amazing discount of 50%. Its manufacturer company upgrades the app regularly, to give new features to its customer time to time. You cannot able to access the device with your tablet. Its return policy is only valid up to 14 days. How many times have you perfectly made a hole in the wall by using a hammer and a nail? Or did you just end up breaking your drilling machine? But what if you get an X-ray vision to see through the walls! But it Seems impossible? Right! Walabot is the device perfect for this type of situation. Walabot DIY is the best product for you to resolve problems. The device is a compact and you can use it for constructors purpose. It can be used by electricians, plumbers, engineers, and more. Buy Walabot DIY today, if you want to make your drilling work easier. Believe me or not, the product proved a miraculous device for me. With all the advantages, I have finally come to identify the studs in my home and leakage problems in the wall. You can also get some amazing discounts on the products from its official website. I personally recommend you to grab the offer before it gets too late. After reading our Walabot review article are you planning to buy this device? For any queries please visit our comment section.